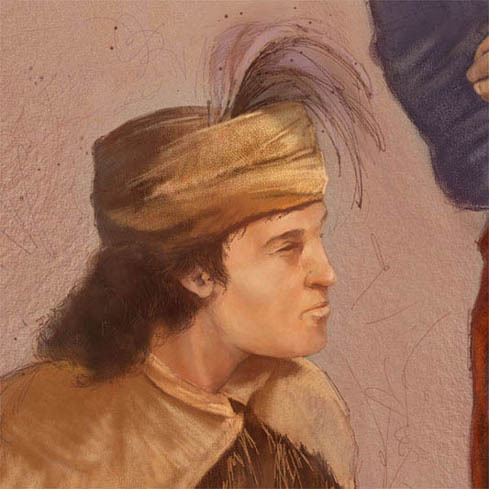 One of the most colorful members of the Lewis and Clark Expedition was its oldest member, interpreter and sometime cook Toussaint Charbonneau – better known as “Mr. Sacagawea” and baby-daddy to young Pomp. One of the main things we know about Charbonneau from the Lewis and Clark journals is that he got on Lewis’s nerves. In his final request for pay for Charbonneau at the end of the expedition, Lewis dismissed him as a “man of no peculiar merit.” Clark, however, liked him better and kept up his acquaintance with Charbonneau long after the expedition had ended. 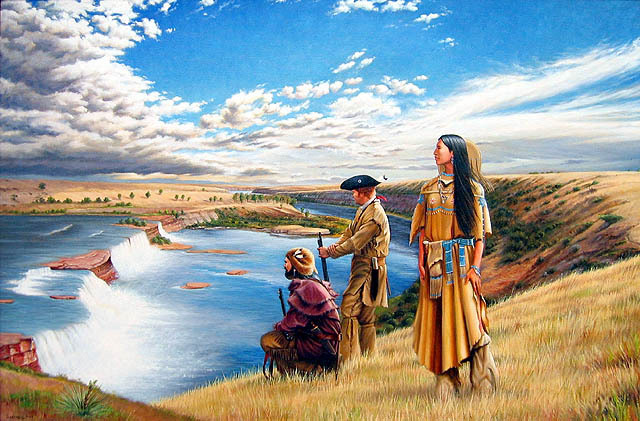 Lewis and Clark at Three Forks, by Edgar Paxton. Charbonneau is depicted on the far right. 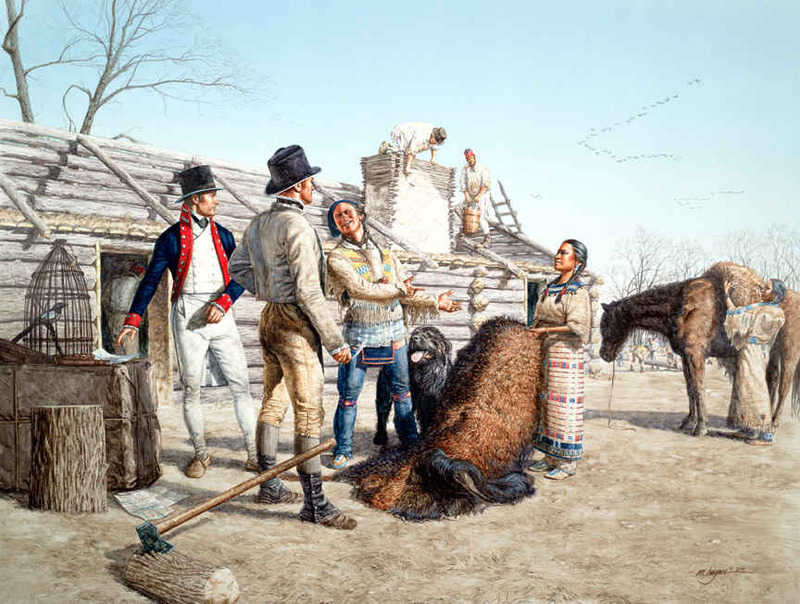 Sagawea’s first meeting with Lewis and Clark occurred on November 11, when she came with her husband and his other Shoshone wife, Otter Woman, to present some buffalo robes as gifts to the officers. She gave birth to her son, Jean Baptiste Charbonneau, on February 12, 1805. Despite the fact that she was a new mother, Lewis and Clark had high hopes that Charbonneau, Sacagawea and the baby would accompany them west in the spring. They were especially interested in Sacagawea, who could help them negiotiate with the Shoshone for horses to carry them across the Rocky Mountains. In other words, Charbonneau quit. A few days later, however, he had a change of heart. Clark wrote: “He [Charbonneau] was Sorry for the foolissh part he had acted and if we pleased he would accompany us agreeabley to the terms we had perposed and doe every thing we wished him to doe &c. &c.” It was back on again. As key members of the expedition’s communications team, the Charbonneau family was in close contact with the captains throughout the expedition, often sharing the same tent. Clark in particular became fond of the family, particularly of Charbonneau’s wife “Janey” (Clark’s nickname for Sacagawea) and her baby “Pomp.” Clark even offered to educate the boy at his own expense, a promise he later made good on. On August 14, 1805, Clark notes that he rebuked Charbonneau “for Strikeing his woman at their Dinner.” While he did not put up with any mistreatment of Sacagawea, in general Clark seems to have not only tolerated Charbonneau, but actually liked him. It happened unfortunately for us this evening that Charbono was at the helm of this Perogue, in stead of Drewyer, who had previously steered her; Charbono cannot swim and is perhaps the most timid waterman in the world; perhaps it was equally unluckey that Capt. C. and myself were both on shore at that moment, a circumstance which rarely happened; and tho’ we were on the shore opposite to the perogue, were too far distant to be heard or to do more than remain spectators of her fate… surfice it to say, that the Perogue was under sail when a sudon squawl of wind struck her obliquely, and turned her considerably, the steersman allarmed, in stead of puting her before the wind, lufted her up into it, the wind was so violent that it drew the brace of the squarsail out of the hand of the man who was attending it, and instantly upset the perogue and would have turned her completely topsaturva, had it not have been from the resistance mad by the oarning against the water; in this situation Capt. 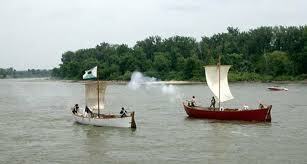 C and myself both fired our guns to attract the attention if possible of the crew and ordered the halyards to be cut and the sail hawled in, but they did not hear us; such was their confusion and consternation at this moment, that they suffered the perogue to lye on her side for half a minute before they took the sail in, the perogue then wrighted but had filled within an inch of the gunwals; Charbono still crying to his god for mercy, had not yet recollected the rudder, nor could the repeated orders of the Bowsman, Cruzat, bring him to his recollection untill he threatend to shoot him instantly if he did not take hold of the rudder and do his duty, the waves by this time were runing very high, but the fortitude resolution and good conduct of Cruzat saved her. Our hunters joined us at noon with three deer the greater part of which I gave the indians. sometime after we had halted, Charbono mentioned to me with apparent unconcern that he expected to meet all the Indians from the camp on the Columbia tomorrow on their way to the Missouri. allarmed at this information I asked why he expected to meet them. he then informed me that the 1st Cheif had dispatched some of his young men this morning to this camp requesting the Indians to meet them tomorrow and that himself and those with him would go on with them down the Missouri, and consequently leave me and my baggage on the mountain or thereabouts. I was out of patience with the folly of Charbono who had not sufficient sagacity to see the consequencies which would inevitably flow from such a movement of the indians, and altho’ he had been in possession of this information since early in the morning when it had been communicated to him by his Indian woman yet he never mentioned it untill the after noon. I could not forbear speaking to him with some degree of asperity on this occasion. 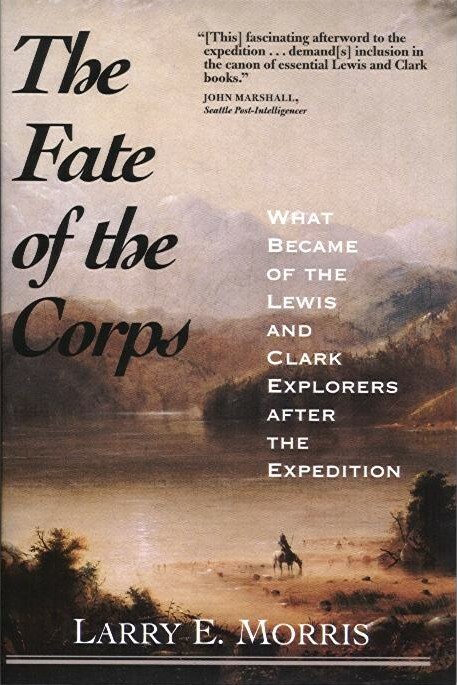 From then on, at times when Lewis and Clark were separated, the Charbonneaus almost inevitably remained with Clark. When the Corps arrived back at the Mandan-Hidatsa villages in August 1806, Charbonneau was given a voucher in the sum of $500.33, his payment for his interpreter duties. (Sacagawea received nothing.) The Charbonneaus remained there until the late fall of 1809, when they boarded a Missouri Fur Company barge and traveled to St. Louis. There Charbonneau cashed in his voucher and accepted his land warrant, another reward granted to all the men on the expedition. However, farming did not agree with Charbonneau. He sold his land to Clark for $100 in 1811 and resumed his job as a fur trapper, this time with the Missouri Fur Company. Leaving his son Jean Baptiste in Clarks’ care, Charbonneau was stationed at Fort Manuel in present-day South Dakota when Sacagawea died in December 1812, leaving behind a young daughter, Lisette. William Clark became legal guardian to both Jean Baptiste and Lisette by order of a St. Louis orphan’s court in August 1813. Lisette did not survive childhood. As for Charbonneau, he lived on until around 1840, continuing to scratch out a living as a trapper, trader, cook, and interpreter for the government. Charbonneau was at Fort Clark near the Mandan-Hidatsa villages in 1837 when a smallpox epidemic struck, killing his Indian wife at the time and decimating the native population. He later took another wife, a 14 year-old Assiniboine girl. It is not known exactly when or under what circumstances Charbonneau died. His estate of $320 was settled in 1843 by his son, Jean Baptiste Charbonneau. Didn’t Charbonneau beat his wife on the trip, and had to be ordered to stop by Lewis? Lisette did survive, there is a marriage record for her in Saint Louis I think she disappears from history after that. There is no other record in the journals of Charbonneau beating his wife, but unfortunately, it wouldn’t have been an uncommon event at that time. As a woman and a Native American, Sacagawea had little social status of her own among white people. She was more or less Charbonneau’s property. thank you for your comments re Charbonneau. As discussed in my book, Clark had a strong relationship with Charbonneau, as he continuously found work for him in the Upper Missouri country as a gov’t interpreter. In fact, Clark had a strong relationship with both Charbonneau men all his life, which was quite unusual for the time and place. This relationship is examined in Jean Baptiste Charbonneau, Man of Two Worlds. It’s available at amazon.com if you’re interested. Suffice it to say that Toussaint was someone who looked out for himself in a raw, dangerous frontier environment, much like everyone else, including Lewis and Clark on their own mission. My uncle’s name is Jean and is brother Robert Charbonneau, they married my mother’s sisters.